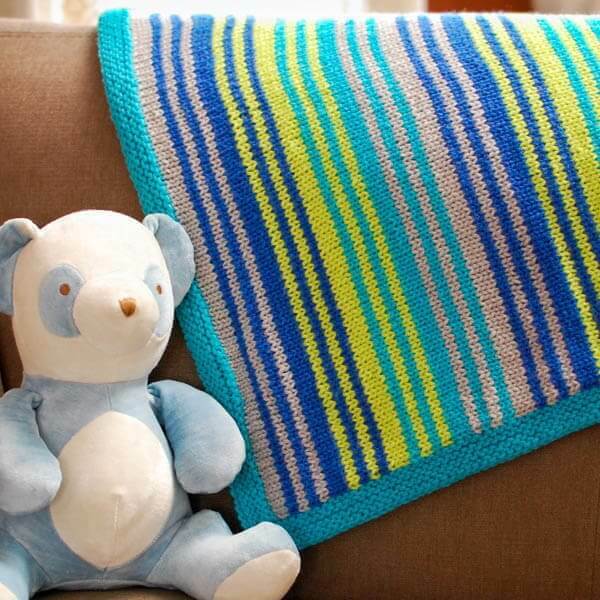 This cozy knit baby blanket pattern features a colorful stripe design will easily stay of favorite way after those baby days are long gone. And best of all it can be easily adjusted to any size you desire! My son is old enough to start wanting “big boy” things but still loves the size of his baby blanket for cuddling up and dragging around. I thought a fun stripe pattern would do just the trick for a blanket that could easily stay of favorite way after those baby days are long gone. And best of all it can be easily adjusted to any size you desire. Finished blanket as written here measures approximately 32 in. × 36 in., but can be easily adjusted to any size. With CA, cast on 142 sts, or as many as needed to reach your desired width. Rows 1 through 8: Garter stitch (knit every row). The body of the blanket is worked in stockinette stitch (knit odd rows, purl even rows) in the following color sequence. 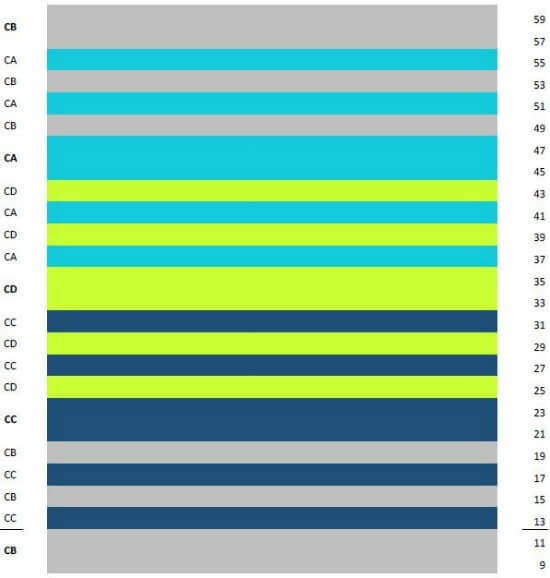 Color sequencing is indicated up left side; Row numbers are indicated up right side. Repeat *Rows 13 through 60 four more times or until blanket reaches your desired length. 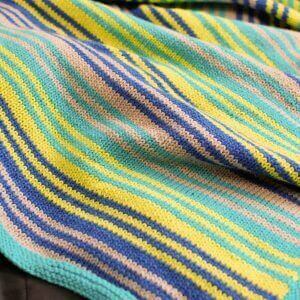 With CA, work 8 rows or garter stitch (knit every row). Bind off. With CA, and with right side of blanket facing you, pick up and knit 2 stitches for every 3 rows along edge of blanket. Continue working garter stitch for next 7 rows (knit every row), bind off. Repeat on opposite edge of blanket. Weave in ends. Click here for more Free Knitting Patterns. Did you cut the yarn after each color? Hi Lisa 🙂 I carried the 2 colors I was working with up the side until I introduced the next color. For example. after Row 20, I fastened off CB, after Row 32 I fastened off CC, etc. What a fun blanket your son can grow with! I LOVE the stripes! Lately all I see is knitting patterns, I guess that means I need to pull out my needles and start trying again. I know the basics. I wish I had someone close to teach me. Like always I refer to YouTube Videos. I think I need to try again, I have had a little success so far. Thanks for a beautiful blanket pattern.